I have described the ‘Marine Lightwheel’ phenomenon in detail in previous articles, so will only briefly describe it here for those who haven’t read or heard of it, and since the excellent eyewitness accounts of the Milius’ crew provide a vivid description. Basically, it seems a nearly unbelievable sight to witness, according to those who’ve been fortunate enough to have experienced it. It is a rare phenomenon that can only be seen in waters rich in bioluminescent plankton-type organisms that are apparently agitated in a massive area of the water by an electromagnetically related planetary force that discharges in geometrically configured shapes as far as the eye can see, such as huge rimless rotating wheels, expanding and imploding concentric rings, and spinning spirals among others. The electromagnetic energy of a source open to speculation, causes the bioluminescent organisms to fluoresce with a light greenish blue glow, rapidly moving in the shapes of and revealing the vortically spinning energy systems agitating them to flouresce. The displays can “stretch to the horizon”, moving like “an underwater Disco light show” at speeds “close to the speed of sound”. All made visible by the agitated bioluminescent micro-organisms that fill the water where the, what would otherwise be invisible, seemingly electromagnetic, and wide ranging ‘energy discharges’ occur. Imagine standing on the bridge wing of a ship on a dark moonless overcast night. Looking down at the water from a height of about 50 feet. Just above the surface of the sea appears to be waves of white light (low intensity) pulsating out of nowhere with a synchronized rhythm. Outward expanding circles, inward imploding circles, waves, moving snakes and boomerangs! The waves of light appear to be traveling at or near the speed of sound and reach as far out on the horizon as the eye can see. With each pulse, the sea explodes with millions of tiny green lights that appear as emeralds on the surface of the water (bioluminescent). It was Incredible and almost unbelievable. It would be hard for me to believe if I had not seen it myself. The light show continued for about 40 minutes before we steamed out of the area and it faded in our wake. My scientific side kicked in. I did suspect that bioluminescence was at least partially responsible for the light show at hand. Generally this is caused when the ship’s wake disturbs species. It tends to glow in a bright green color, much like that of a phosphorescent light stick. It usually splits like a giant V from the ship’s hull as we pass through the water. If something biological was being disturbed then what was causing it? Looking at the speed and pattern… I assumed that it was sound. It was obviously slower than light but much quicker than anything that I had ever seen caused by wind or waves. That theory was quickly put to rest when the spirals began. It wasn’t as if something was producing the light at the center and it was following the spiral by growing. More like if you had a giant light that had a spiral cutout blocking part of it and then rotated it. Like something that belonged on a dance floor. The centers of these spirals passed directly down our ships beam. You could pinpoint the exact center. I couldn’t believe or begin to explain what I was seeing. More evidence of an Electric Universe. Last edited by nick c on Mon Mar 28, 2011 9:44 am, edited 1 time in total. A very interesting account. I hope for more. You can read more on this phenomenon, albeit from an obscure and out-of-print source, on pages 112-113 of The Fringes of Reason: A Whole Earth Catalog (1989, Harmony Books [a division of Crown Publishers, Inc.]). These pages appear in a section called "An Encyclopedia of Anomalies," and are bookended by discussions of "Diffuse Electrical Discharge Phenomena" and "Falls" (of ice and stones). If you can find Fringes, get it. The tone of the book is "sympathetic but critical" of "New Age" beliefs and fringe science, but whatever your attitude, it's a lot of fun. Those accounts are amazing, and the phenomena doesn't appear to be isolated friction or something of that sort. I'd be extremely interested in some follow up analysis & interpretation (even if on the somewhat speculative side). The first couple of accounts seem similar to accounts I've heard of that were investigated as possibly related to UFO's, although, when the "hunters" with cameras went out into the water, nothing was found except the bioluminescent organisms. Certainly, electromagnetism above and beyond the organisms, themselves, was never considered. It does take a conceptual framework to synthesize all the various patterns, but once you do have the framework, electromagnetic phenomena jump out all over the place in the Earth's environment. And, when you consider the ionosphere one electrode and the surface the other one (and into the depths of the Earth), then it makes sense that the atmosphere in between with various electrically conducting mediums would be infused with electrical current in one form or another. And that's why this is important -- if Man had a full grasp of this dynamic -- what would Man be able to do with this knowledge? I firmly believe this to be true, so the question is whether it's sooner or later? We need it as soon as possible. The challenge is to get men to open their eyes to this great potential. Once men are cognizant of this potential, creative minds, I'm sure, would figure out ways to tap into this, at present, untapped resource, and Man would experience another jump in enlightenment and technological advancement akin to the great revolutions of the past, of which Tesla and electromagnetism were so instrumental in bringing into being. Last edited by nick c on Mon Mar 28, 2011 9:42 am, edited 2 times in total. Reminds me of the cosmic wheel of antiquity. I brought the maypole up because it fits a pattern of historical recognition of natural phenomena. Interesting that there was thunderstorm/lightning activity nearby. I can't help but think about the rings over Switzerland that showed up on radar a few weeks ago, which happened to precede a series of minor, average for that area, tremors in a circular pattern culminating in a 4+ mag. quake a few days ago. Seems to be a dark current vortex that's stimulating and preferentially sorting/scavenging the bioluminescent plankton. The report of a mist of energy above the water, with a specific comparison to St. Elmo's fire or ball lightning from a witness, sounds like the dark current impinging on the surface of the ocean, ionizing the water vapor enough to boost it into glow mode. Sounds like a current sheet. The plankton near the surface behave like a dusty plasma would. One of the exciting things to me about this phenomena, as far as confirming the validity of EU theory, is that there is no explanation other than EM forces causing the phenomena. Shortly after moving to St. Thomas, Virgin Islands, I not only witnessed a water spout, on a perfectly clear calm day btw, but when it came onshore straight in my direction, the vortex collapsed and I stood under the deluge of water that had been in the vortex. I was about a half mile from where it hit the shore. There was a definite ozone-esque, after a lightning storm sort of feel to the air. 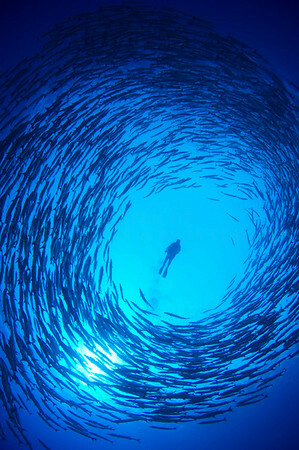 Schools of fish often swim around in a circular pattern. After talking about this phenomena, my partner said she witnessed a school of Salmon swirl in a counterclockwise toroidal pattern for at least 20 minutes. Most animals are pretty sensitive to EM fields, especially migratory species. I suspect they're guided by a dark current discharge vortex. I also have seen schooling fish swim in that type of torus shaped pattern. In particular, schools of Southern Sennett in the Cayman Islands come to my mind, but many types of schooling fish behave this way. 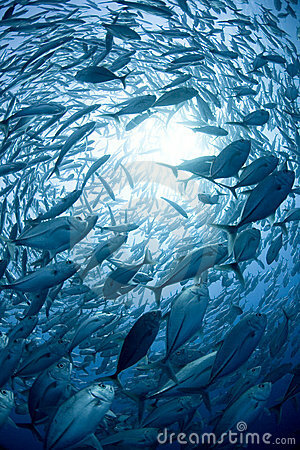 Also, I have seen schools of fish swim in tight spheres, so that it looks like a solid ball rolling along the reef. If a school of fish swimming in a spiral or torus pattern were near the surface at night, they could create a bioluminescence giving a luminous effect which might explain some of the observations. Although, it does not seem to explain all of those eyewitness accounts. Last edited by nick c on Tue Jan 26, 2016 10:59 am, edited 1 time in total. Schooling fish swimming in balls or rings is pretty common, actually. The thought is that it's to either intimidate or confuse predators. IE, predator sees something "giant" (bigger than itself) or predator sees too many small things moving in various directions and gets confused. speed(s) of the waves, pasterns, formations and dissolutions. Associating marine lightwheels (which I already knew about) with Birkeland currents is my original idea (not to say any one else hasn’t had the same thought), which came to me as I read the account of the USN ship's encounter. The simpler crop circles may also be instances of gentle land touch downs. Tornadoes and hurricanes may also be associated with Birkeland currents from space. Craters on the Moon, etc. are gouged out by these things, not by impact. We (some plasma cosmologists) think the Grand Canyon is an example of what a powerful traveling Birkeland current can do in the space of a few hours. Bryce Canyon is an example of a relatively stationary current touch down. These operate on the same principle as EDM (electric discharge machining). ( BC's may or may not be luminous; they come in a great variety. Plasmas operate in three general modes, depending on the excitation of the constituent ions: Dark Mode (invisible), Normal Mode (the glow discharge, also called Glow Mode) and Arc Mode (electric arcs). There are two different speeds of sound, one for air and one for water. for air (about 340 m/sec). These speeds are probably only of secondary interest. If the spokes of a ‘wheel’ or the ‘slats’ of a ‘grating’ were 20' wide and spaced 20' apart, the wavelength is 40'. Three of those 40-footers passing by per second is 120 feet per second wave speed, as an example. it and then rotated it. Like something that belonged on a dance floor. concurrent lightning is another possible clue. There are other pieces of data that can be fit into this picture. recorded electromagnetic, magnetic, electric, or particle flux disturbances? The numbers 28 and 56 are associated with multiple Birkeland currents (BCs) traveling in the same direction. These number are from direct observations. I have no idea what is special about them. 56 = 2 * 28 but what does 28 signify? The radial Birkeland currents in the dime store plasma ball are an example of an arbitrary and rapidly variable multiplicity and branching. BCs tend to impinge on surfaces perpendicular to the local plane of the surface. Each of the two filaments that make up a single "twisted pair" or "double helix" BC rotates about their common center. The rotation rate is correlated with the current density and with the lateral spacing between the twin filaments. The Mode of the BC -Dark, Normal (also called Glow), or Arc, is a function of both the current density (energy density) and of the ionizable particle density of the medium the BC is traveling through. The plasma ball manufacturer's employ a certain ionizable gas (argon? cesium?) mixture at a set pressure, trading that against a set voltage maintained between the inner globe and the outer envelope (of fixed radius), to get a Glow Mode BC. A higher voltage, all else equal, would result in an Arc Mode BC, probably frying the product and voiding the warranty. A lower voltage would result in a Dark Mode BC, not of interest to the consumer. 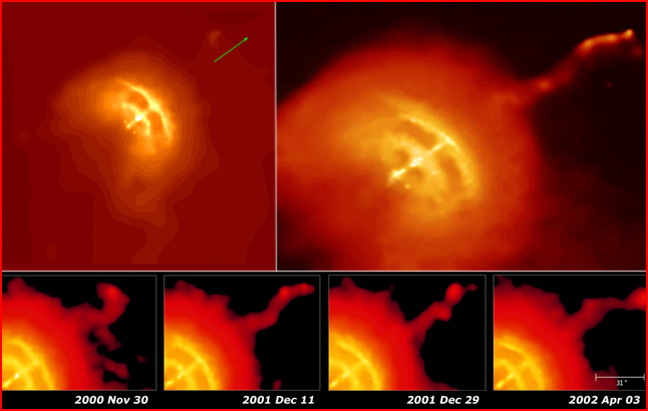 BCs, and plasma phenomena in general, act on all scales, from the microscopic (observed) to the intergalactic (speculation from direct observation). The BCs for crop circles and marine light wheels are oriented vertically. They impinge on the water or land surface perpendicularly. They are generally in Dark Mode, invisible. There may be a single twisted pair, rotating about a common axis, or a multiplicity of twisted pairs, often arranged as (28) pairs around common center, like the Stonehenge arrangement, or the Supernova 1987A arrangement. This single BC or multiplicity of BCs vertically impinges on the surface of the sea (a conductor, remember) while rotating about a common axis, growing and shrinking in size, dancing around and doing other things throughout its time of existence. The plankton in the sea is excited by the momentary electric current passing through it, or possibly by the secondary mechanical effects from the current passage (like the mechanical effects of a ship's wake) This is much the same geometry as a CRT (cathode ray tube). The bioluminescence of plankton has the same sort of *persistence* as the phosphors of the CRT screen. After the electron beam is turned off or moves away, the CRT phosphor continues to emit radiation for a short time, as does the plankton. Various combinations and timings of the above factors, can produce the spokes, wheels, and spirals: as seen on TV, on the surface of the sea, or on the CRT. It’s encouraging to finally see some serious discussion of the Marine Lightwheel phenomenon, following this amazing recent sighting that I wrote about in the article in question here. Thank you so much for your attention to the subject, your responses, and speculations on it, including some interesting comments forwarded to me by Forrest Bishop. When I first learned of Lightwheels in the mid 1990’s I instinctively knew it was related to the non-manmade ‘Crop Circles’, and other related phenomena that my husband, Ed, and I have spent a combined over 40 years researching. I wrote my first article on the subject, published in Nexus Magazine, in 1997. 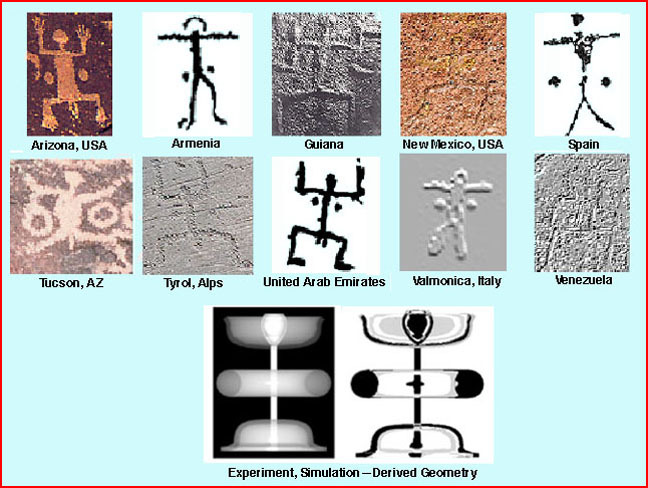 Ed and I have long held that a complex combination of electromagnetic and other forces were responsible for most of the non-manmade crop circle formations, including pictograms, that have appeared in England, and have been observed to have anomalous effects and other significant characteristics not found in those made by humans, and we have dedicated ourselves to sharing our observations. OK. Don't quite know what to make of this. Not to mention that tingly, hairs on end, what the....????? moment. Considering the interactions of human consciousness (I've done a bit of energy healing, learned how to see auora's...) and how all things are ultimately connected, I couldn't help but see a connection between these two crop circles and what is likely at the center of the galaxy...a z-pinch plasmoid. There is a new radio telescope networking array to see the GC at submillimeter wavelengths. They aint gonna see a black hole. When the results of the new networked array's data comes in, I wonder if it would overlay pretty well with the above? Interesting universe we live in without a doubt. solrey wrote: When the results of the new networked array's data comes in, I wonder if it would overlay pretty well with the above? Semi random geometric designs. Not really seeing a correlation with plasmoids or Birkeland currents or whatnot? Abstract;One of the intriguing events accompanying large tsunamis, especially those that strike the Pacific coasts of Japan, is the luminous phenomenon; many historical Japanese documents have described how fire balls or pillars of fire seemed to come out from the sea when tsunami approached. Among 17 events of large tsunamis from 684 to 1946, where the surface wave magnitude was greater than 8 or the tsunami magnitude was greater than 3, nine tsunami events accompanied luminous phenomena. In spite the event's high probability, few explanations have been offered as to the source mechanism except luminescent planktonic organisms, which is hardly plausible because luminous tsunamis have been eye-witnessed even in the winter season when such planktonic organisms are less active, and even in the daytime when the intensity of light emitted from planktonic organisms is unlikely to exceed the day-time brightness. Most tsunami earthquakes are thought to be associated with sediments in the accretionary prism. One recent important finding is that large volumes of stable methane hydrate are present within ocean-floor sediments at water depths exceeding about 500m at 10wer temperatures. When the equilibrium conditions of coupled low temperature and moderate hydrostatic pressure are disturbed by an earthquake, the hydrate abruptly decomposes. Conversely, a breakdown of hydrate may cause a further mass movement, and a cascading chain of events may occur. Some eye-witness reports in historical documents strongly suggest that luminous phenomena associated with tsunami are attributable to methane hydrate disruption, not others causes such as luminescent.